The COMPLETE HATCHERY is an extraordinary collection of diverse esoteric, paranormal, Native American proverbs, postmodernist philosophic terms, even the nuances of gourmet wine-tasting, all designed as a lexicon for instant cyberdivination in the production of wholly new and original “blended meta-constructs,” called FROGS, or “Fluid Resonance Oracle Gnosis” set in motion with a Random Number Generator. (Samples from tarotpsych members are included on FSA under CyberExperiments). 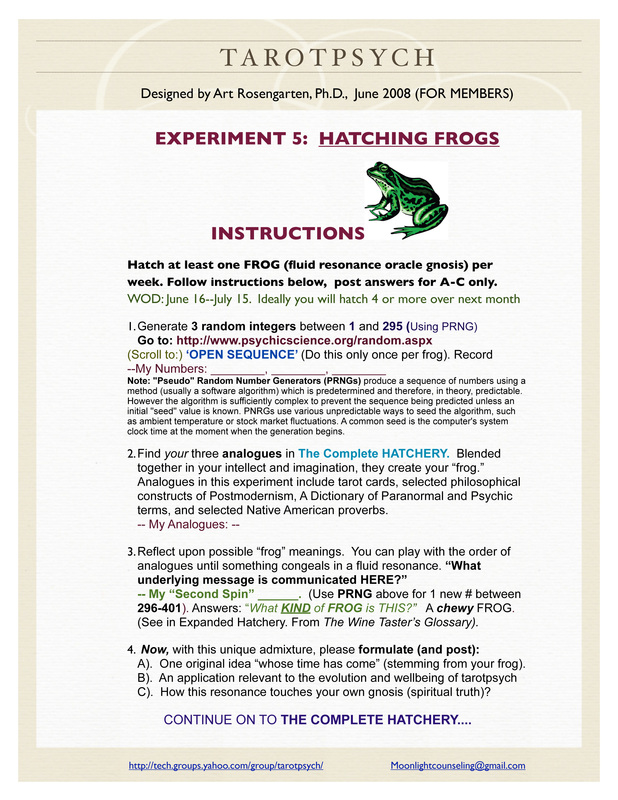 The instructions below can be found in the Files Section of Tarotpsych, and available to Tarotpsych Members. (The Complete Hatchery is currently 36 pages, with over four hundred interesting entries; instant access to a Random Number Generator, and easy instructions to make this deep pool of knowledge very accessible, and wildly worth “hatching,” as we say).